We’ve pledged to continue to sponsor triple gold Paralympian Hannah Cockroft for the eighth year. Our Managing Director Ryan Wilby, not only presented Hurricane Hannah with her latest sponsorship cheque but staff also raced against her eating her favourite pre-race sweet – strawberry laces! Not only is she speedy on the race track – but she’s pretty quick at strawberry lace racing, beating most Caravan Guard staff. But she had to settle for second place against one of our insurance advisers, who left Hannah with a quarter of a lace in her mouth! 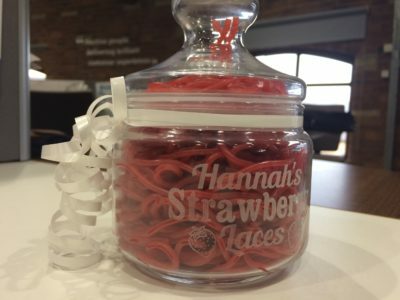 As a memento of her visit to tour offices we also gave her a personalised jar of strawberry laces. 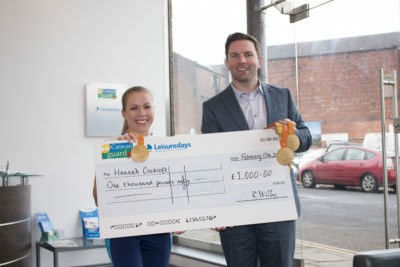 Caravan Guard began sponsoring Hannah before her success at the London Paralympics, which led her to becoming a household name. The company has committed £9,000 in sponsorship over her career so far. Hannah raced to victory three times in last year’s Rio Paralympics and is now ready to defend her titles as she prepares for the IPC World Championships and the 2020 Paralympic Games in Tokyo. 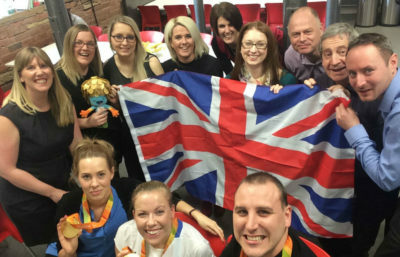 Caravan Guard insurance advisers and support staff got to hold Hannah’s latest trio of Paralympic gold medals from her T34, 100m, 400m and 800m races in Rio. She also posed for photos and answered questions about her Paralympic success, world records and her hopes for this year’s championships. “I always thank my sponsors after every race but I can’t thank Caravan Guard enough for being with me from the start of my racing career and for continuing to support me so I can achieve my dreams,” said Hannah. “I’m thrilled they’ve pledged to sponsor me through to the Tokyo games – it’s so important to all athletes at all levels to receive the extra financial support. Hannah has just returned from a month’s intensive training in Australia and will be competing in the 2016 IPC World Championships in London in July. She’ll be defending her title in the T34 100m, 400m and 800m races and hopes to bring back the gold once again. Sadly, she’s not had much time to get away in her dad’s campervan after her most successful year yet – maybe after the London championships…? Ryan said Caravan Guard was committed to continuing to support their local hero. Well done caravan guard you should all be very proud for the support you have given and continue to give to Hannah! !